The perception of a straight linear relationship between the money supply and inflation is not backed by theory or practice. The true relationship is captured by measuring monetary growth NOT BACKED BY ECONOMIC GROWTH, rather than monetary growth alone. By grasping this relationship, you are able to model and understand the high price inflation we are experiencing. 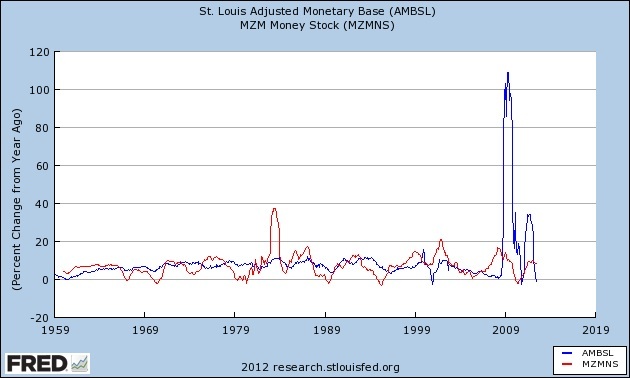 The first point to make clear is that the monetary base is not money and not a measure of the money supply. You will hear commentators refer to the Fed’s quantitative easing program as “printing money”. In actual fact, it would be more accurate to call the Fed’s program an attempt to get the commercial banks to create money. The major component of the monetary base is bank reserves. These reserves form the asset backing of the money supply, but are not the money supply itself. To measure money supply, you need to look at the liabilities of the commercial banks, rather than assets. Clearly the Fed’s QE attempts have led to a HUGE rise in the monetary base, but this has NOT led to a large increase in money supply, as measured by MZM. However, the FED hasn’t increased the reserves in vain. It was concerned about a collapse in the banking system. It is safe to say that without the increase in the monetary base, we would have seen a DECLINE in money supply. So now we have the picture straight for the money supply; let’s move onto its relationship with inflation. The perceived relationship is that every increase in dollar money supply, will lead to a proportional increase in prices. But it doesn’t take very much insight to see the flaws in such an argument. What if the economy is growing? Do productivity increases not mean that prices should GO DOWN as it becomes easier to make things? How has the theory worked out in practice? Using gold or oil as a measure of price change (see my article on flaws in the CPI), we see that changes in the money supply are TOTALLY INADEQUATE at describing changes in prices. 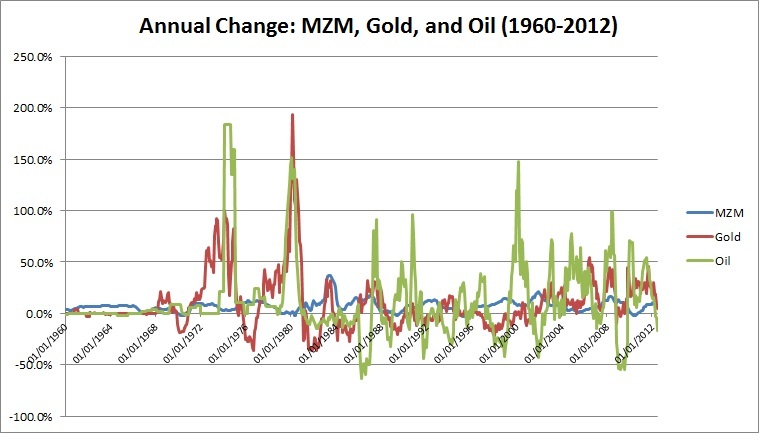 There was a big increase in commodity prices in the 1970’s and yet monetary growth was not unusually rapid, while the 1980’s and 1990’s were times of falling commodity prices, even though monetary growth was just as substantial in these decades. The reality is that the traditional view is simply not able to capture the relationship between money supply and inflation. The statistic that should concern us is monetary growth, not backed by economic growth. As the economy grows through productivity increases; prices should decrease. Money supply growth in line with economic growth will result in stable prices; money supply growth above economic growth will lead to increases in prices. We experienced a large increase in commodity prices in the 1970’s in spite of tepid monetary growth because productivity was decreasing over the decade. Prices went up as America got poorer and could demand fewer goods per dollar. We had a decline in commodity prices in the 1980’s & 1990’s because productivity was increasing, even as the money supply was increasing at a slower rate. Each dollar could demand more goods on a like-for-like basis as its intrinsic purchasing power increased. We now have a clear understanding of the relationship between money supply and inflation. Price inflation results from money supply growth that is in excess of economic growth. This may be in the face of a growing economy or a declining economy. The key is the RELATIVE RELATIONSHIP between money supply growth and economic growth. The reason for rapid price increases in the last 12 years is the same as the one for price increases in the 1970’s. Central banks have been propping up the money supply in the face of a declining economy. So even though money supply growth hasn’t been huge, it has been excessive relative to the underlying economy and has led to price inflation.